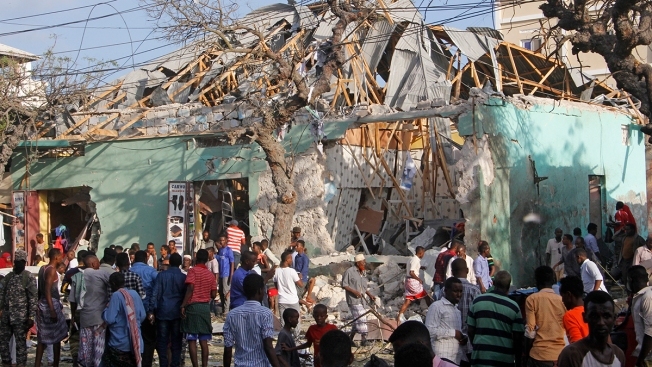 In this March 22, 2018, file photo, Somalis stand outside a destroyed building after a car bomb exploded in Mogadishu, Somalia. The Trump said Thursday that Somalis granted special immigration status in the U.S., which was first offered in 1991, can keep the designation due to ongoing armed conflict in Somalia. The Trump administration said Thursday that Somalis granted special immigration status in the U.S. can keep the designation, making them one of the few groups permitted to stay in the U.S. under a program that has allowed them to remain here for years. Somalia was first designated for the special status in 1991, following the collapse of the authoritarian Siad Barre regime, and the designation had been extended in part because nationals feared returning because of the ongoing armed conflict there. Homeland Security Secretary Kirstjen Nielsen cited the armed conflict and other extraordinary conditions in supporting the continuation of Somalia's designation for about 500 people. But the administration will not take on new applicants, disappointing advocacy groups. Those already with the status will be able to remain in the U.S. and will be allowed to work through March 17, 2020. Many Somalis have settled in Minnesota, which has the largest Somali population in the U.S. Community and immigration advocates have said that returning to Somalia would be a death sentence for some and that it would separate families. Democratic Minnesota Gov. Mark Dayton wrote a letter to President Donald Trump on Tuesday, urging him to extend the special status. Dayton's letter said the conditions in Somalia are treacherous, and he pointed to a recent State Department advisory that tells people to avoid traveling to Somalia because of crime, terrorism and piracy. The advisory says those who do travel to Somalia should draft a will before traveling, name a family member to be a point of contact in the event of a hostage situation and leave a DNA sample in case it is needed to identify remains. "Under those conditions, it would be horribly 'Un-American' to force innocent people to return to Somalia, to break up many of their families, and to forgo their chances to live safe and decent lives," Dayton wrote. Members of Congress, including Democratic Sens. Amy Klobuchar and Tina Smith of Minnesota, also wrote to the president, urging that the status be extended. Advocates for Somali nationals who are living in the U.S. said Thursday they are relieved that about 500 Somalis will be able to reregister to extend their protected status for 18 months, but they are disappointed the administration didn't do more. The Minnesota chapter of the Council on American-Islamic Relations said if the administration would have redesignated the status instead of just extending it, then more than 1,000 Somali nationals could have enrolled. The International Rescue Committee and Muslim Advocates also expressed disappointment. "It is not only a mistake, it is a death sentence," Muslim Advocates said in a statement. Around 437,000 immigrants from 10 countries have had temporary protected status, a designation created in 1990 to allow people from countries ravaged by natural disasters like earthquakes or man-made disasters like war to have a short-term safe haven. Those with it have generally been able to work and, with permission, travel outside the U.S. and return. Countries are added to the list as circumstances warrant, with renewals coming usually around every 18 months. While some countries were removed, others have stayed on for years, which critics say turns the program into default amnesty. Other countries that had the status for long periods of time — like El Salvador or Honduras — were cut off under Trump. The protections were never meant to be permanent. Under Trump, the Department of Homeland Security also ended the program for Sudan, Nicaragua, Nepal and Haiti. Several groups are suing to stay in the U.S. Protections were extended for about 1,100 Yemenis and 6,900 Syrians who already have them, but the administration has said it won't take on new applicants. Trump has said he wants to curtail legal immigration and has been cracking down broadly on illegal immigration.